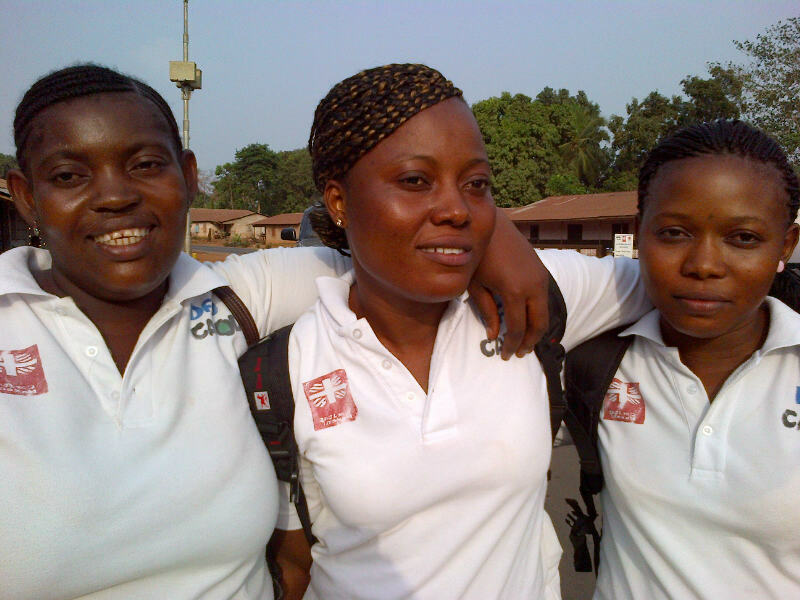 In her second blog from Sierra Leone, Nana Anto-Awuakye writes about a volunteer burial team on the front line of the fight against Ebola. We leave behind the bustle of Sierra Leone’s capital Freetown, where the Ebola prevention posters plastered across all available wall space, and on cars and motorbikes, are now looking tattered and faded. The landscape changes from precarious half-built houses perched on the hillsides surrounding the city, to lush green savannah grasslands. We are heading to Kambia in the north-east of the country, a district that became a hotspot as the Ebola epidemic gripped the country last year. Sandwiched between the urban district of Port Loko to the south and the border with Guinea – where the virus started – to the north, the odds seem stacked against this unassuming town. But an amazing partnership has developed here between the Sierra Leonean Ministry of Health, local volunteers – including teachers, students and farmers – and CAFOD, to form the Safe and Dignified Burial team of Kambia. Together they have refused to be overwhelmed by the odds stacked against them. On a piece of land the size of two football pitches is an important part of the operation – the Kambia Ebola Response Fleet site, managed by CAFOD and its local partner Caritas Makeni. There are ambulances and support vehicles, a workshop for mechanics (the dirt tracks to remote areas take their toll on the vehicles), a cordoned-off decontamination area, a warehouse stocked with boxes of protective clothing, and an area with wooden benches like a football dug-out, for the burial volunteers. There are 60 volunteers in total, including eight women. Their goal is to reach zero new cases and to remain at zero for 42 days. This means that the dangerous work of removing the bodies of people who have succumbed to Ebola must be done quickly and professionally following stringent guidelines. The team are proud of their record of no-one contracting the virus as a result of their work – a testament to their work ethic and professionalism. Michael, the team leader, brings the volunteers together at 7.30 in the morning with prayers and a popular hymn, “Tel Am Tenki” (“Give thanks to the Almighty”). Then he calls a register of names and the replies come back: “I’m here”. This daily roll-call becomes poignant as it hits home how much these ordinary people from the community are putting their lives at risk. 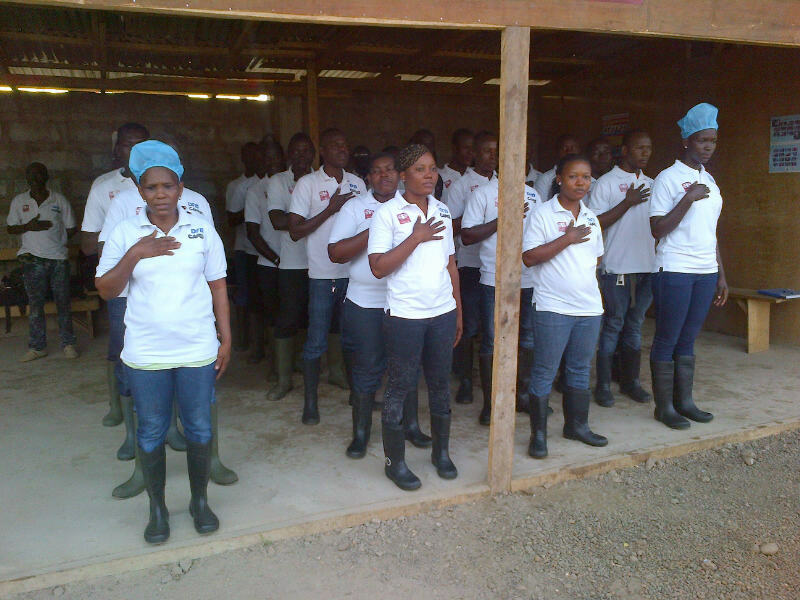 These volunteers are the foot soldiers in the struggle to ensure that Ebola becomes a thing of the past here – and it is thanks to their dedication and commitment that Sierra Leone will win this fight.